Guitarists constitute an important basis of the home studio market. These excellent consumers do not hesitate to sacrifice a big part of their budget for legendary guitars and amps, much more actually than for the microphones needed to record these elements, and all of this of course to get THE sound. 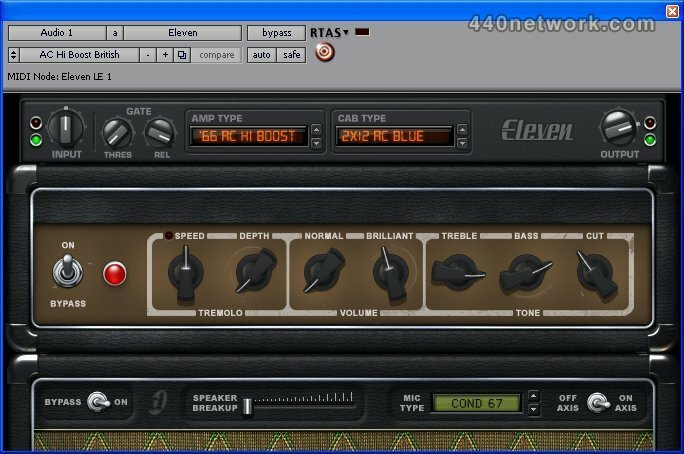 Does this type of emulation really replace a tube amp? No, it only replaces a recorded tube amp, which is not the same at all! Think of the classic disappointment of the Soldano owner, as he records with a small SM57 this huge sound that makes his whole studio vibrate: inside of the mix it'll probably sound great, but the take is nothing like the amp in itself. So forget about the majestic power of the Soldano, we'll be looking for its colour instead. Will it be possible to get everything one should be able to get from a tube amp this way? No, for instance there won't be any feedback (unless you put the sound extremely loud on your own loudspeakers during the takes, which is not to be recommended), nor will there be any real headroom, as the plug-in "mike" compensates for any eventual level increase (you can't tweak its gain by yourself), which puts us sometimes in a kind of blurry situation. Anyway the differences in the playing on a tube amp are rather well rendered here, although less important than on a real amp where a soft play on a heavily saturated sound should give a warm and clear sound for instance. Now let's talk about Eleven LE : here one can separate the amp from the cabinet and its mike, which makes it possible to do diverse things. Like takes with several mixed mikes, with several cabinets, or even put several amps on one cabinet. More astonishing, one could as well use the output of a real amp in Eleven's speaker cabinet, or even use the plug's amp on real loudspeakers - in this case though you should check for the right output impedance. You get it, the possibilities are huge. In the associate examples we first tried Eleven with a clean solo sound (Fender '59 Tweed Deluxe and its cabinet) with a nice plate reverb from Kurzweil. Then the same recording with a saturated sound, with less reverb though ('69 Marshall 1959 100-Watt Super Lead – Plexiglas Head with a '64 Fender Black Face Deluxe Reverb 1x12" with Jensen cabinet). The result is nice and well defined with the Aria and its Humbuckers; strangely enough it was less interesting with the Telecaster. One thing to note, we never used any equalization or compression on the guitar sounds, this in order to hear the sound "as is" out of Eleven LE. After that we integrated a rock drum loop made by Igorrr with two saturated guitars, and this time we systematically doubled the cabinets with 2 microphones, one on and one off axis. A phase modulation wasn't necessary here but could have been obtained on a sample basis with a short delay, which once again increases a lot the sonic choices. In the other there's an Aria on the left and a Telecaster on the right. It is clear that the difference between the two guitars is remarkably smaller than on a true amp, but the sound is working very well in both cases. Is that a good thing, or should we regret it? Well it's just a matter of taste, a great advantage for small budgets and a noticeable loss for the owners of rare collection pieces. Finally let's point out that the Power Chord play wasn't as good as on a real amp, the power you get on a Soldano for instance being somehow far above its emulation. Therefore we'll use our favourite stacks of pedals before the input for that special purpose. Anyway the whole thing remains very nice and smooth to use, and very natural sounding in a mix. Our favourites: the VOX AC30, JCM 800 and Digidesign Custom Vintage Crunch, a home creation which is a sort of best-of in its genre! Particular mentions to the MIDI Learn, which is rare in Pro Tools and allows a truly more intuitive work on the sound, but mostly to the excellent Speaker Breakup parameter, which allows to make the speaker saturate more or less and adds an infinity of colours. Remarkable and unique, as far as we know. So we've got plenty of amps and sound colours, all tube designed and well recreated. As well as numerous speakers' cabinets. Notice that at some points Eleven LE reached panicked peaks of CPU use that blocked our machine for 3 minutes before it calmed down. Weird, but an update should correct this bug. The microphones used are also quite close to the colours of the originals, and an SM57 will often work much better than a Neumann U67 for the simple reason that it has less restitution within the high part of the spectrum, where a guitar amp cabinet is mostly about medium frequencies. We were still globally surprised by the restitution of static microphones, as they usually are a lot more aggressive when used in close-up recordings (in general they need to be filtrated). Did Digi engineers do that for us? The add of the Royer R121 is finally most welcome, this ribbon microphone being one of the newly favourite mikes for this kind of recordings in the US. Smooth and nice. Then the whole plug is only available for Pro Tools, which already had exclusivity on Amp Farm and Chrome Tone, and it is sad for those who would have liked to use it live. Anyway Eleven LE is a success: a quick comparison with Waves GTR shows that the sound "out of the amp" is more natural in Digi's plug, although most of the amps, cabinets and microphones modelled are the same for all the guitar plugs. Of course all that Eleven doesn't have makes a difference in the final sound, but purists will get the best of both worlds by mixing these two plugs… if they can afford it. Now plug your guitars! Eleven LE is a Digidesign product. This MacMusic section is managed by Nantho with the help of the translators team. You are welcome to send your own articles.